I didn't go to Butler University, but I grew up in Indianapolis (and still live here) and have numerous friends who did. Their mascot is a bulldog, and they have an actual bulldog that attends all sporting events. 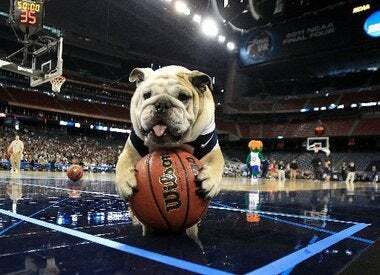 Butler Blue II (in picture) just "retired" in May and Butler Blue III (or "Trip" as he's known) took his place. The same family owns both dogs, and they both have their own Twitter accounts and blogs. One of my friends shared Butler Blue II's latest blog post with me, and now I'm totally crying. My beloved yellow lab Lilly died of stomach cancer last winter at the age of seven, and I totally know what this family is going through. Poor puppy! !